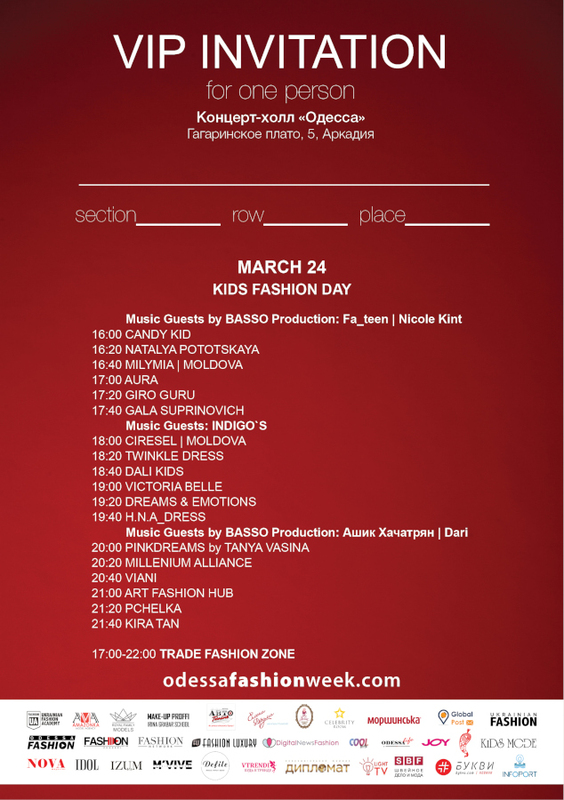 On March 20-24, the 10th Anniversary Season of the Odessa Fashion Week FW 2019-20, which includes a multi-level program for the development of the fashion industry in Ukraine, will take place in the Concert Hall “Odessa”. More than 40 designers from Ukraine, Germany and Moldova will present their collections: MISS DM, ALLA FRENKEL & PLAY FASHION JUNIOR, MARYNA KOZACHENKO, VOVK, ELEN GODIS, HITFIT FASHION, THE COFFEE JACKET | GERMANY, RUSLAN KHVASTOV, Yu-Linka & ROYAL FAMILY, DOMINIK DZHOKER, PODIUM UNIKALNOSTI by MADAM TYUR’E for CHANGE-AGER, SLAVA FASHION, ODESSA PROFESSIONAL LYCEUM OF TECHNOLOGY AND DESIGN, ODESSA TECHNICAL COLLEGE: FORS–FUROR | S.K., UKRAINIAN FASHION ACADEMY, JUST SEW, YULIA PUKHTA SOUTACHE JEWELRY, ELVIRA GURSKAYA, BAEN, IRYNA MYKHAILOVYCH, KOLLECTIVE & ANNET, LOANII STAR, CANDY KID, NATALYA POTOTSKAYA, AURA, GIRO GURU, GALA SUPRINOVICH, TWINKLE DRESS, DALI KIDS, VICTORIA BELLE, DREAMS & EMOTIONS, H.N.A_DRESS, PINKDREAMS by TANYA VASINA, MILLENIUM ALLIANCE, VIANI, ART FASHION HUB, PCHELKA, KIRA TAN, MILYMIA | MOLDOVA, CIRESEL | MOLDOVA and LIDIA SELICI | MOLDOVA. On March 20 and 21, an educational fashion conference will be held on a relevant topic: Fashion Business, Pr & Retail. Speakers include Alla Lisogor, Nadezhda Lapteva, Victoria Stolyarova, Sergey Mishchenko, Artem Wizart, stylists Elena Shtogrina, Veronika Kukota and Olga Voinikova, photographers Maxim Finogeev, Vasily Galushkin and Arthur Kaplun, as well as famous bloggers Karina Bulavskaya, Anastasia Satsyuk and Alen Antonov. 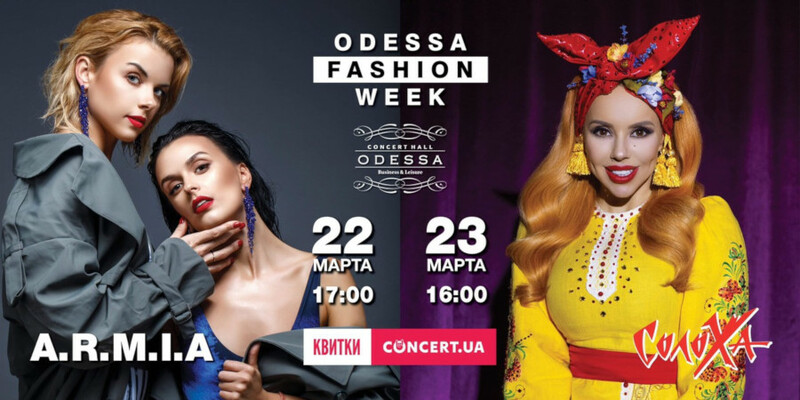 On March 22, the opening ceremony of the 10th anniversary season of the Odessa Fashion Week FW 2019-20 will take place in the Concert Hall “Odessa”, the hall of which will be converted into a professional platform for a fashion show. In addition to the shows, the guests are waited music show by the Trio DSD: modern electronic music accompanied by live instruments – drums and saxophone, as well as dance hits in exclusive remixes from DJs. And also singer Slava Voinikov will present his best songs for the guests. The headliner of this day will be the duo A.R.M.I.A – a famous pop group that combines bright style, irresistible charismatic performance, professional vocal and choreographic training. Ukrainian show business knows girls thanks to their favorite hits: “Other”, “Independent”, “We did it”, “Ripe”, “I love you”, “I swear”. On March 23, within the framework of the Graduate Fashion Day, will be held a competition of young designers – the New Fashion Generation, and the main result of the evening will be the Awarding Ceremony. Guests are waiting for speeches by Pelagia Stefoglo, LOZOVOY and the female group COCOS. The headliner of this day will be an incredibly charismatic and talented blonde, with the appearance of a Hollywood star and a real Ukrainian flavor – SoloHa! On March 24 will be held Kids Fashion Day, where Ukrainian and foreign designers will present their collections for children. As part of the Kids Fashion Day, a young but rapidly growing INDIGO’S badn will appear, consisting of two unique and charismatic girls Nasti & Katy. The band is only a year old, and they already have several video clips in their account. Also the special musical guests of this day will be the pupils of the BASSO production: the band Fa_Teen – cool girls who sing and dance perfectly, and also confidently go to the release of their audio album. Ashik Khachatryan – the voice of a talented vocalist fascinates and penetrates into the depths of his soul, and the bright presentation of the performance is impressive! Nicole Kint is a model singer, Nicole charges the audience with the energy of her brilliant vocals and amazing dance! Dari is a bright personality that intrigues. In the framework of Odessa Fashion Week, Dari will present the premiere of his new incendiary song! From March 22 to March 24, the Trade Fashion Zone will operate on the territory of the Concert Hall “Odessa” – the territory where the clothes, shoes and accessories of Ukrainian and foreign designers will be presented, which each of the guests can try on and purchase. There will also be presented photo- and brand-zones from partners of the event who prepare treats and special gifts for all our guests.